Sound Like An Offer You Want To Promote Too? When you recommend our content-packed evergreen webinar, our "Done For You" offer at the end gives your customers their very own network of ready-made membership sites. 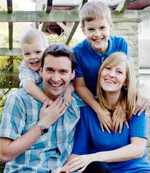 Each site is based around the online marketing/online business/business success niches. Customers get 10 complete sites all networked together and automatically cross-promoted. Your customers get everything "ready to go" and make sales immediately. In addition to setting up everything for them, we also provide full support, and extensive training materials to ensure they succeed. 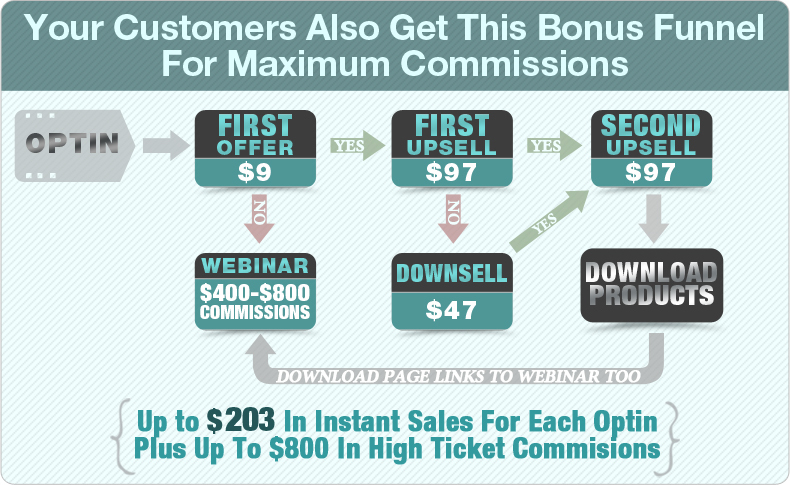 To make sure your customers get massive value, they also get a special bonus funnel that's been tested with over $100,000 of traffic, and has sold for as much as $1,997 on it's own. 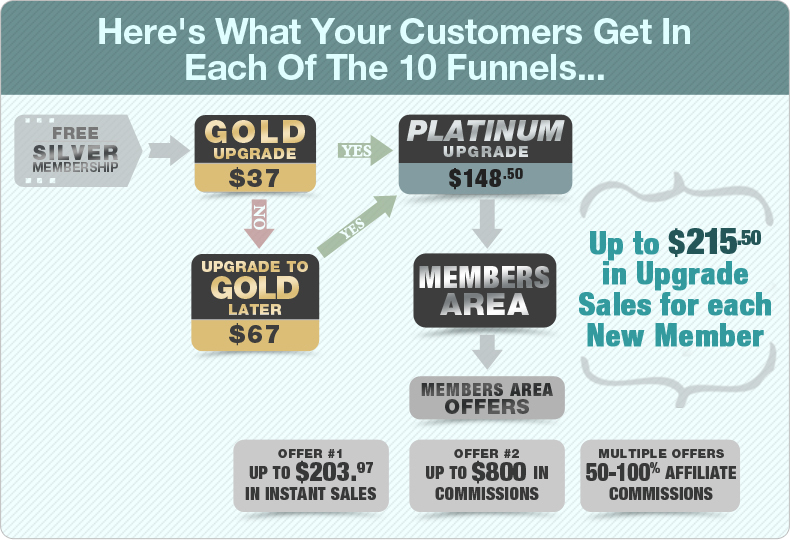 With these ready-made funnels, your customers will be able to generate multiple streams of income, and build a targeted list of subscribers, without ever having to touch a line of code. 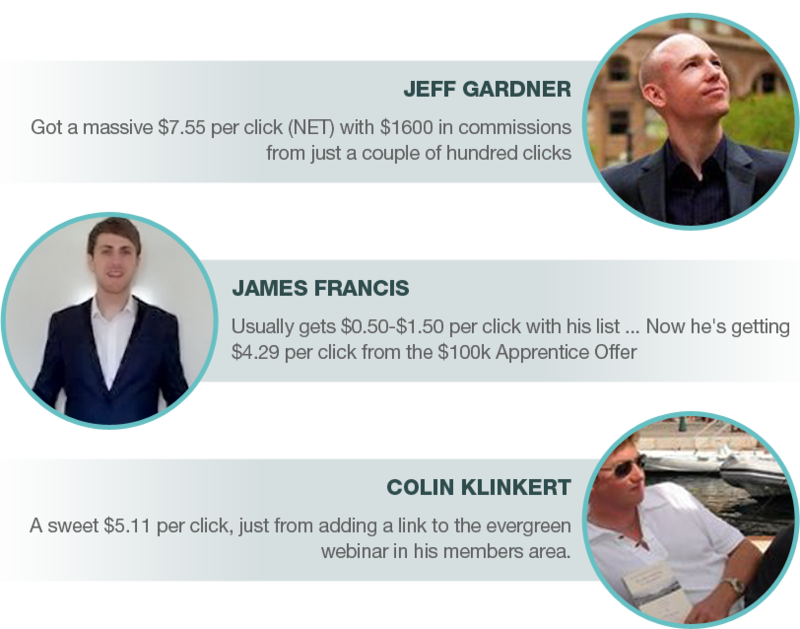 Super Solid EPCs: Our average affiliate's net epc (from front end sales) is over $3.10 per click, based across tens of thousands of clicks. Some JV's have seen net epcs as high as $7.55 just on front end sales. 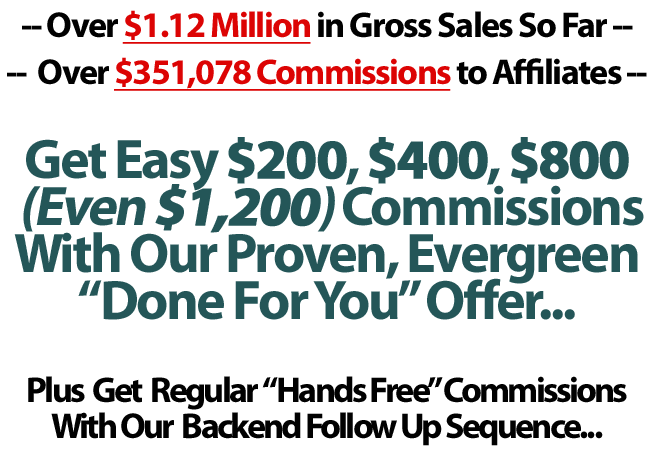 Easy Commissions: Our proven offer has a broad appeal making it an easy sale regardless of what sub-niche your list may be into. Example: Chris X added this to his download page for an FB Scraper software, generating a $5.96 net EPC. High Quality Product: Built using proven to convert content and materials, it delivers real results for your customers. Tons Of Proof: We have customers sending us raving testimonials, case studies from other partners, all helping to boost conversions. Full Support For Customers: You care about your customers. WE care about your customers. We'll give them everything they need to succeed with dedicated support. Massive Goodwill: You can "Give Away" the high quality webinar access as a bonus training and instantly add more value to any existing offer and have your list thank you for it. Low Refunds: Our current refund rate is just 6% which is unheard of for a $1997 offer. Customers are happy and you get to keep more of what you make. Custom Promo Tools: Need a custom promotion tool? No problem, we'll get it done for you. Just let us know! Lifetime Cookies: As we add more products to the backend, you'll get paid on those too. No extra effort needed on your part. Reciprocation For Quality Offers: Do you have a product with a $2+ EPC and less than 10% refund rate? We're looking for solid products to consistently promote within our evergreen sales funnel. We want to reward partners and develop long term partnerships that are beneficial for everyone involved. So, make just 5x$1997 sales in your first month and we'll send you a $2,000 cash bonus, taking your commisison to a massive $1,200 per sale. Plus, keep sending just 2 sales a month, and we'll broadcast your high converting offer to our subscribers AND integrate it into our evergreen sales funnel. Promo #1 - 56 New Customers To A $997 Product. This was a promotion for a high ticket launch for a $997 product. Over the launch period, our promotion generated 56 new customers (with a mix of $997, 4x$297 and 12x$97 price points). This was a promotion for a $97 offer with a $497 upsell. Generated over 150 sales during the launch period. This was a promotion for a 7 day firesale. Generated over 110 sales during the launch period. This was $297 offer open for 7 days, but only promoted for the first 3 days. Still generated over $4k in sales during the 3 day period. Offers marked '*' are backend/followup products. All EPCs listed above are just from front end sales. Once filled out you'll get taken to the tools page with some ready made email swipes and banners, and if you need ANYTHING at all just contact me. If you need anything, email me at: Richard.Legg [at] Gmail [dot] com and I'll get back to you as soon as possible. Thanks for reading and I look forward to working with you!